You likely have team members who think worship is all about the music. Or it's all about how they feel during the worship service. What does it mean to be “worship leaders”? Your team members help lead worship whether they're vocalists, instrumentalists, or even techs who serves behind the scenes. Each week, they're part of helping create, support, and lead the gathered worship experience at your church. 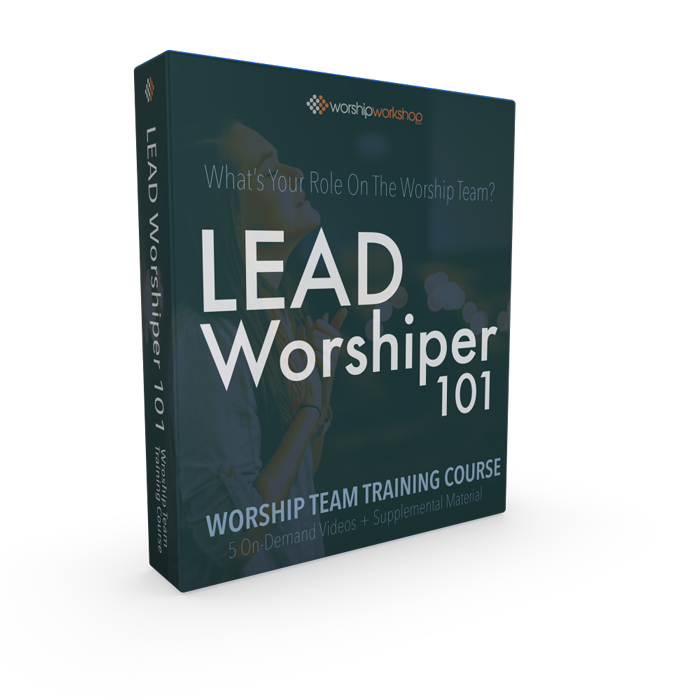 Your team will more deeply understand their Biblical, two-fold role as lead worshipers. Your team will explore and discuss why they do what they do. And how it’s NOT just about making music. Your team will learn that being on the worship team is NOT about their personal or stylistic preferences. They'll also learn how to make it all about Jesus…even when they're the ones on a "stage." Your team will begin to explore how to lead expressively and how to engage the congregation...all without making it a performance. They also discover how they can lead with authority and confidence. Feelings and emotions are a valid part of worship. But your team will explore how worship is a matter of choice. And they'll learn how to worship even if they don't "feel" spiritual. After this course, your team will have a deeper understanding of your job as worship ministry leader, and know how to better support you. This course is done-for-you training. Five on-demand videos will help your team journey towards a deeper understanding of what it means to be lead worshipers. The music ministry in the church isn't any more special or privileged than any other ministry in the church. But there are some unique responsibilities for team member, especially those who serve on the platform. Practice and rehearsal aren't just about sounding "good." Your team will learn how great preparation will help them be better leaders and more expressive worshipers. Our role on the platform and in the production areas requires more than just showing up prepared musically and technically. This course will help them understand what kind of heart preparation the worship ministry requires. How To Lead When You Don’t Feel "Spiritual"
Sometimes, we show up to serve and we just don't feel like worshiping. This course will help your team to know that's OK. It's normal. So we talk about what to do in those times when we don't "feel" like leading and serving. Your team will learn why it's important to be intentional not only about which songs we sing, but also how often we sing them. Team members can get sick of songs long before the congregation, so we deal with that issue. Worship team members don't just lead musically, but also visually. How they express their worship and engage with the congregation matters. This course will introduce them to platform presence and Biblical expressions of worship. Not available outside of Worship Workshop, other than through this special. A $97 value if sold as a standalone product.